Do you love to be unique? Hate most of the mass-produced, expensive junk from chain jewellery stores? Ever walked into a party and met the horror of someone else wearing your outfit? If you answered ‘yes’ to any of those questions, this site – and its accompanying shop – has been built for you. My name is Sakina, and ‘being unique’ is pretty important to me. I like to stand out. A lot. I also believe in ‘good value’ and ‘getting more for your money’, two concepts that are often misused in modern marketing. 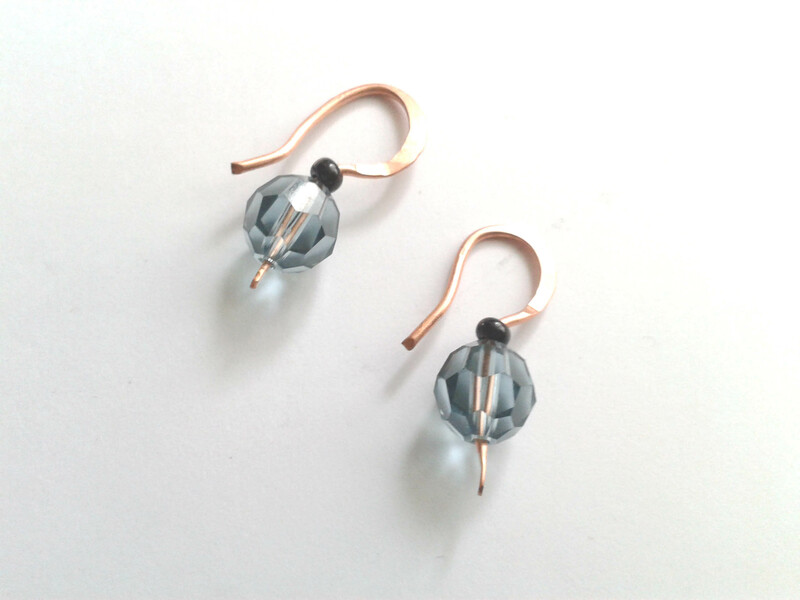 Handmade copper jewellery is the answer that fits all of the above and more. It’s unique, affordable, can be intricately worked, and you can make it look shiny or antiqued. 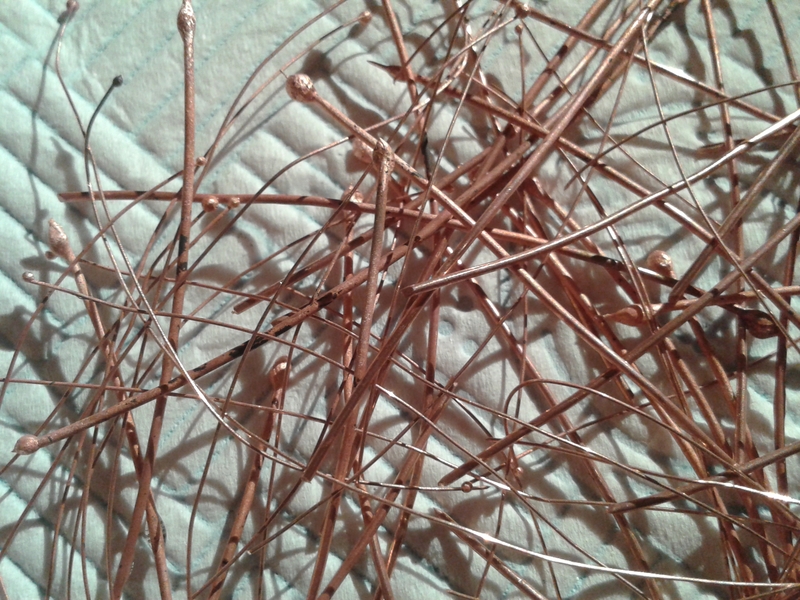 Need more detail about copper? Oh, and of course I want you to be the first to see the newest jewellery pieces. That’s important when they’re one-of-a-kind. Hit the button at the top of the right hand column to follow Practically Perfect. Blog posts published no more than one per week. No spam in your inbox. If you’ve been through my shop at all, you’ll have noticed a few items are marked **SENSATIONAL SECONDS**. Now, we all know what ‘seconds’ are, but maybe we don’t all call them the same thing, so I thought I’d explain what this is. Sensational Seconds is what I call my seconds shelf. It’s a bit like when you’re in an artisan pottery, and you find the shelf that’s waaaaaayyyy cheaper and full of what look like perfect pieces of tableware. For a potter, you might expect that the bowl wasn’t quite as perfect as the others, or that it didn’t throw perfectly straight. For Practically Perfect’s jewellery, it’s either if there’s a design flaw (like the colours don’t quite work together or if some of the beads are heavier than they want to be) or if it just didn’t work out as perfectly as I’d wanted. I want perfection damnit. 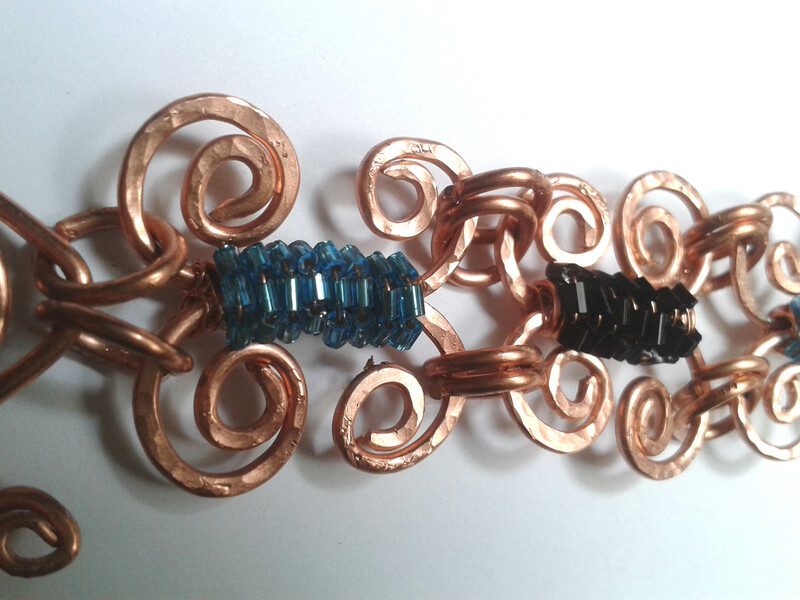 When I created the coils, I made them too tightly packed together, which made it hard to work the wire that holds the beads. So the beads are tighter than I would have liked them to be. They can be moved back to where they’re supposed to be, but they don’t stay put. It’s a lovely bracelet. It’s comfy to wear, and it’s striking. Not only that, but because it’s designed for your wrist, it’s unlikely to be still long enough to be under scrutiny for anyone else. And it took me hours to make. So I calculated my hourly rate at £3.50 to keep the costs right down and it’s posted at just over £9. I don’t wear bracelets myself – they catch on everything – so it’s totally available to be loved by someone else. My home is full of wibbly wonky pottery bowls and one-of-a-kind items that have a charm all of their own. It’s not everyone’s cup of tea. But I’m sure that the right person will come along and fall in love with the Butterfly Bracelet, and all its little, extremely wearable friends. Texturising my work is something that comes naturally to me. It’s like an urge, and one that’s easy to overdo. I guess the eye likes it busy, but not too busy, and too much to take in can be uncomfortable. For the first time in my life I’m learning the art of restraint. Maybe. Because of that, I haven’t done much flat forging up to now, and normally prefer to texturise the metal with the peen end of my hammer so the wire glints in the light and tarnishes ‘authentically’. These two heart pendants needed different treatment, however. The first one, with the Swarovski crystal, really doesn’t need anything else going on. It totally has enough texture already. That’s one reason it gets just a simple leather cord. The busy coil, coupled with the faceted crystal heart is plenty for one glance. By keeping the details to a minimum, the person looking at it can fully appreciate every part of it all at once. And since it’s designed to be worn, only the wearer is likely to catch more than a glance anyway … You get my thinking here? 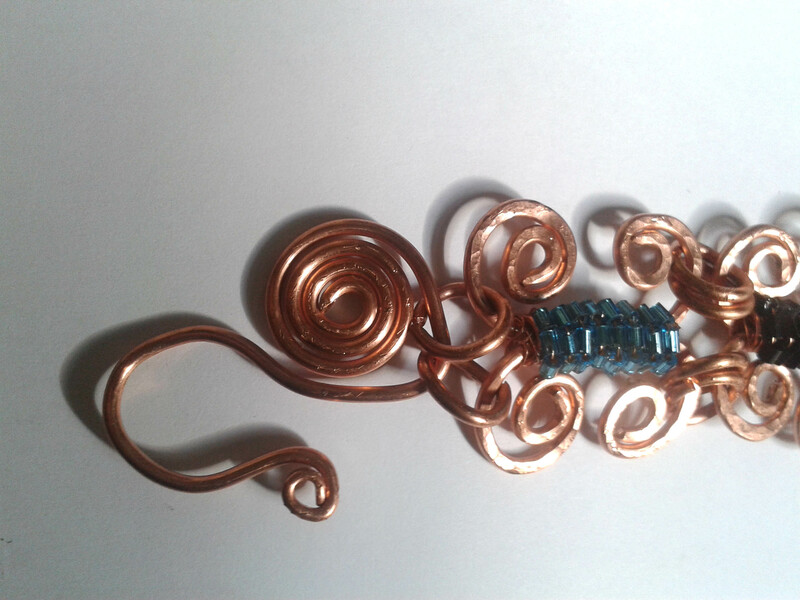 The flat spirals seem to point to the intricacy of the coil, and the crystal is distracting, which makes the whole piece something to look at for longer. 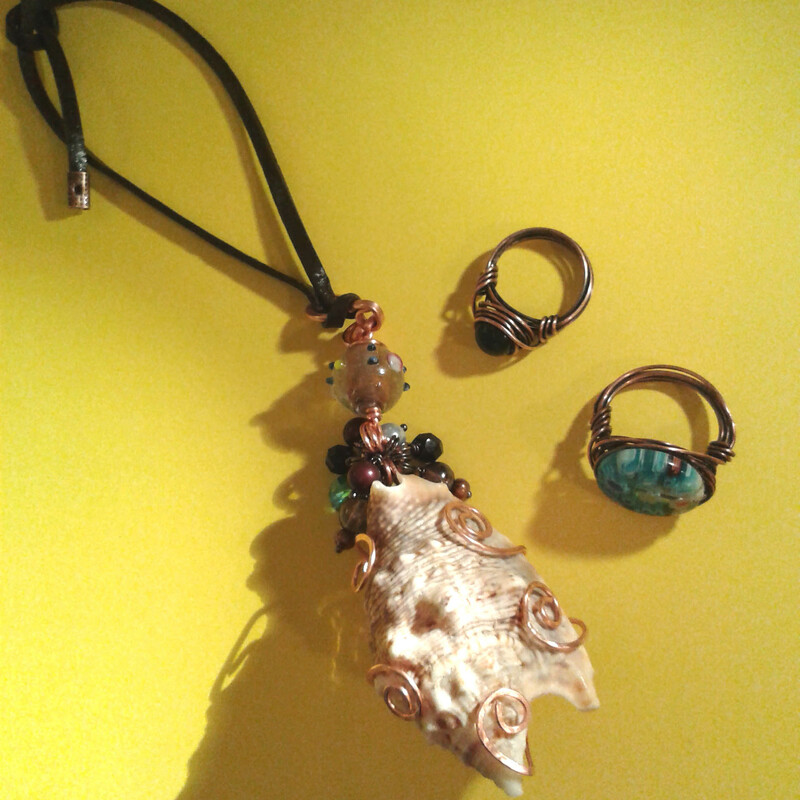 Most of those comments can also be placed with the second pendant, the one without a crystal. However, there’s a juxtaposition in this one between the austere plainness of it, and the busy, tight coiling, and that gives it a different kind of attractiveness. The basics of how these copper heart pendants were made. These babies look intricate, but the design is really simple and kinda makes sense to itself. I bent a length of 1.6 mm wire in the centre, to create the point of the heart frame, and coiled the ends of the wire until they were both close enough to bring together and shape into a heart. I flattened the coils but left the rest of the heart frame round, and took about 5ft of 0.8 mm wire to begin a basketweave to cleave the two spirals together. 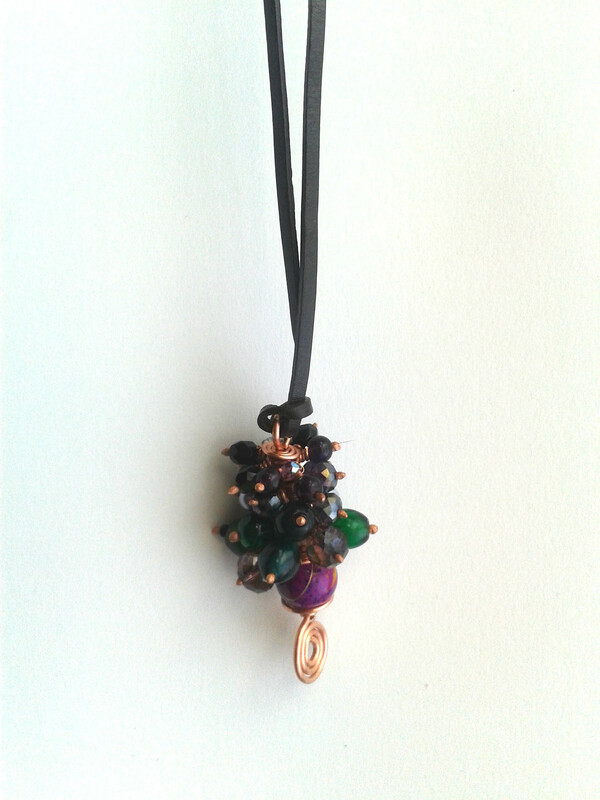 The tail sticking out from the start of this in the first pendant created a loop to hold the crystal. The basketweave became the coil, and I wrapped the wire more or less continuously around the pendant frame, finishing at the basketweave. The pieces are finished off with an inverted heart-shape bail, attached to the coil with two solid jump rings. 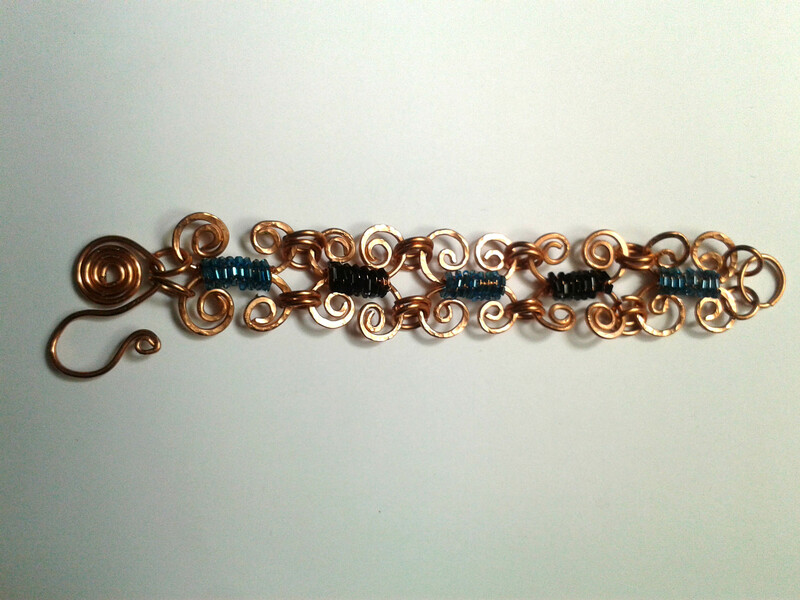 I originally planned to make some gypsy wire wraps (see Janice Berkebile and Helen Stanley’s book mentioned on My ‘Tutors’ page) to accommodate the bail, but realised in time that they probably wouldn’t be strong enough, and would easily wear out. The terrors of design! 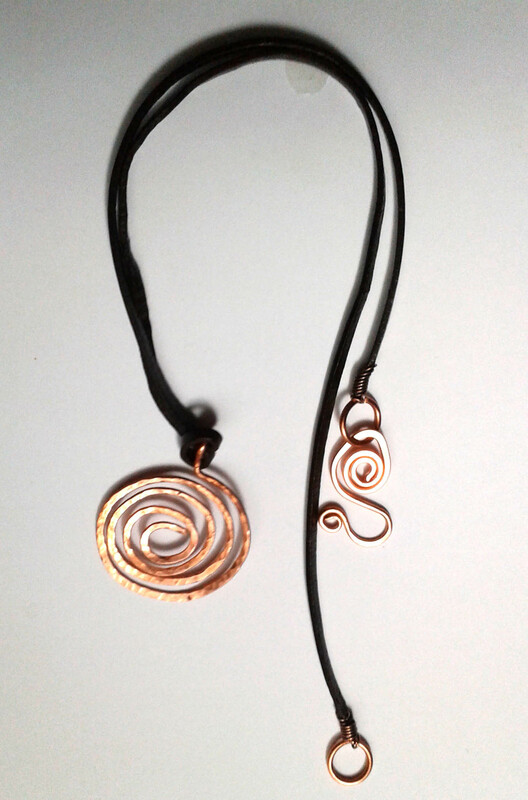 The leather cord is finished with a spiral shaped hook clasp and a jump ring. 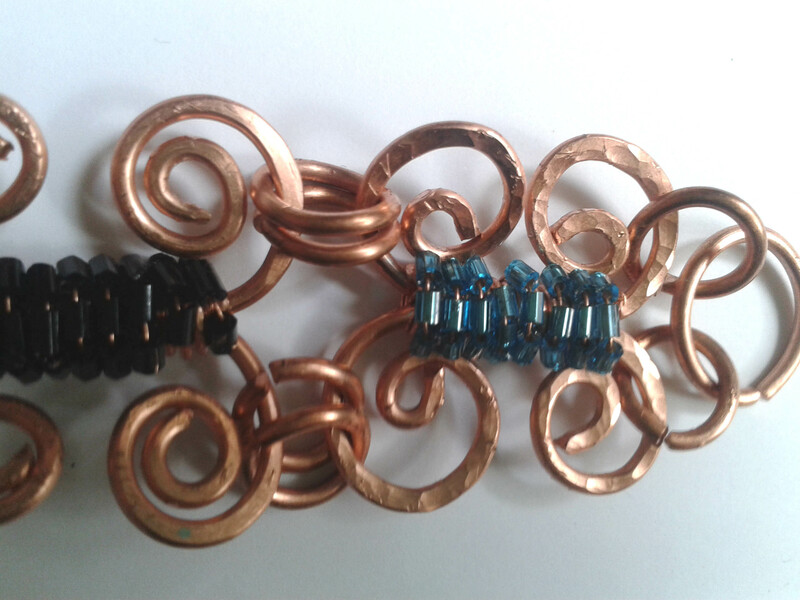 I could have made a copper chain to hold the pendants, but it would really detract from the simplicity of the shapes, so chose against that. I named these pendants ‘I Give You My Heart’ as a sort of commemoration of a wonderful love in my life, but honestly, I think they’re the sort of gifts you give to someone you love in open recognition and acknowledgement of the way you feel about that person. The pendants kind of contain or embody that message and there’s something really real about it because the pendant is cold and hard and solid, a good reminder. Just my romantic take on it, maybe, but I like to think I make objects of beauty that can be used for lovely things. I become mesmerised by beads. So many shapes and colours, my eyes try to take them all in. When I work with beads, I’ve found I’m the proverbial kid in a candy store. There’s just so much to choose from. Bunny in the headlights time. Should it be weird purple AB Swarovski crystal 6mm with dark green cheap glass bead 10mm, or is there going to be too much green in the whole thing? What about the tiny transparent Preciosa crystals? Or the 6mm Preciosa faceted jet? Is your head jangling yet? At least my options are limited as I don’t have that many beads yet. Yet. In the end I gave the piece a funky sparkle with more faceted beads and broke ‘the rules’ to dot 4mm crystals amongst some of the larger beads. So sue me. The trick is to have at least a tiny plan, like knowing the general colour scheme, or being determined to make the piece under- or overstated. It’s destiny is to be someone’s special Christmas tree decoration. 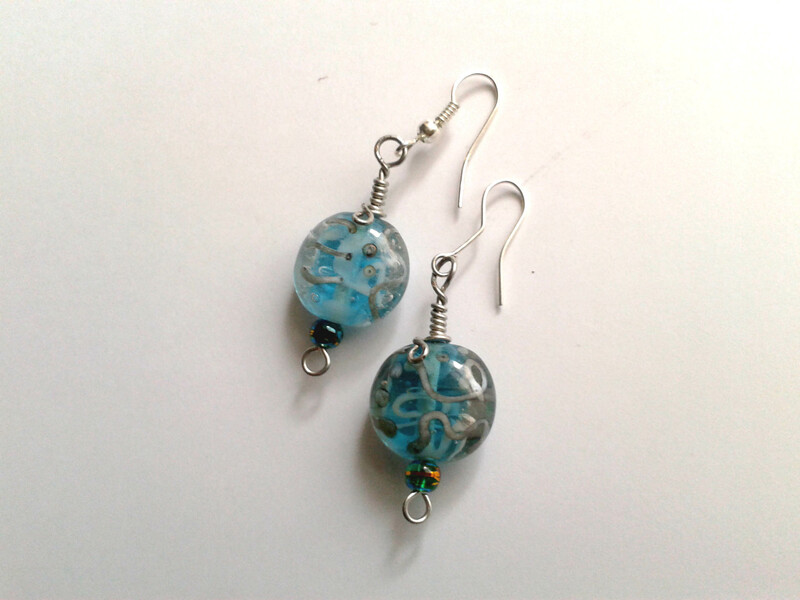 Here I’ve used a base of green beads with a few murky-looking crystals to give them spark without adding more distinct colours. I then overlaid those with a mixture of Preciosa crystals and lovely purple crackle glass, giving the whole thing some lift with light-coloured Swarovski crystal pearl beads and some 4mm bicone crystals. It’s a lot of words to describe the simple but quite grand thing you see in the photo. All the beads are threaded onto the same stalk that forms the spiral at the bottom, and they’re pushed down by the eyelet at the top. Hopefully they won’t move. Unique Christmas tree decorations bring something a little bit special back at a time when ‘special’ can get lost in the horrors of mass production. It would be nice to slow down and really enjoy decorating the tree. Here’s another I made the other day. I’ll put these two in the shop in the next day or so. I take very bad photographs. Not only is there likely to be a tree growing out of the top of absolutely anything that I photograph, but it will also be out of focus or fuzzy due to an involutary movement that takes hold of my arm at the moment the shutters close. Even when someone else is taking the pictures. 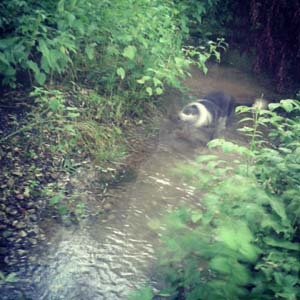 It really is the dog moving, not me. But Etsy and customers understandably want photos of the items they might want to buy. No problem for most people, right? All the crafting sites recommend you get your photographs done professionally. That’s one thing if each piece you make is worth £60 a time (or even if some of them are) but with lower cost products it’s a bit harder to negotiate. The only remedy for my terrible photography is Instagram. It’s my only way of producing nonfuzzy, still shots that are in focus and are reasonably easy to compose nicely due to their square shape. However, I do realise that a square shot in artificial light, filtered to an entirely different colour scheme, is not going to be adequate for any customer. Who would blame them? You need to be able to trust the image in a product shot. So today I got my mum to come over with her trusty FinePix (yeah, I said I needed her help; I meant I needed her to do it for me :)) and we titted about with picture frames and handheld lights until we’d photographed more or less everthing in the portfolio. Unfortunately, her cable has gone missing, so we couldn’t transfer the images straight away, so we have no idea what sort of quality the photos were. I need a plan B, maybe urgently. This is going to be an ongoing problem.